Although the SpaTap requires no assembly whatsoever, we provide two types of hook (adhesive and self-tapping) plus fishing line (if required), which will simply act as a secure fastener to allow every retailer’s shops ceiling SpaTap to hang from their preferred location. A)”Have you tried showering under it? I have! We don’t boast it’s a high pressure water shower, it’s very difficult to fit a high pressure shower in your pocket. A) It’s NOT a power shower – It’s a tap primarily! A) SpaTap is designed for maximum water efficiency, maximum Spray using minimal water, delivered via internal fluid dynamic technology. SpaTap – The world first, stunning, award winning, “Go Anywhere” “Fit Any Bottle”, eco-friendly, water saving, pocket sized, shower and tap ! Awarded first prize for its innovative brilliance and design excellence at the prestigious 2015 Water4Africa Awards, this one of a kind Australian invention is now set to capture the imagination of people worldwide and rapidly become a household name. There is literally no person on earth that would not benefit from owning a SpaTap! This dynamic and durable device, with a lifetime guarantee, delivers benefits throughout the entire outdoor and recreational sector: Camping, fishing, trekking, cycling, 4WDing, barbequing…the list is endless – anywhere you need an outdoor tap, you need a SpaTap ! Your customers will instantly fall in love with the SpaTap, a truly amazing new paradigm in water delivery, hygiene, lifestyle, recreation and family fun! • SpaTap’s force fit sealing mechanism can fit many bottles of different girths. • SpaTap can turn a 1.5litre bottle of water into a 13 minute shower or a 15litre (office water cooler bottle) into a 2 hour and 36 minute shower. 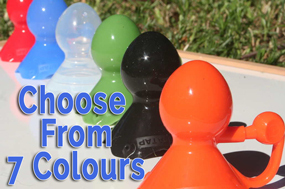 • SpaTap is made from premium quality food/water grade silicone; it’s safe, UV stable and will last a lifetime. • No matter what the activity or where people are, they will always require water. SpaTap conveniently attaches to any bottle to provide a flow controlled washing and showering station wherever it is needed. • SpaTap utilises the base of the inverted bottle as a soap caddy and / or toothbrush/toothpaste holder. SpaTap Solves A Multitude Of Problems! • Camping and BBQ – conserving water, multiple washing stations, convenient handwashing, cleaning dishes, washing food, tooth brushing, washing down pets and equipment. • Fishing – cleaning fish, cleaning equipment, handwashing, hygiene. • Boating – Hang anywhere, wash salt away, hydration, cool down. • Sports – Hang around pitch, hydration, heat stress, hygiene, clean cuts, bruises. • First Aid – Cleaning wounds, eye wash, hydration, wash away broken glass and debris. • Children – Water efficient pistols, asking children to wash their hands (they want to do it) Asking children to clean their teeth (they want to do it) Every parent’s dream come true! Please contact us to discuss all your sales, marketing, and specific media (print, social or digital) requirements. SpaTap is fully patented, copyrighted and trademarked.